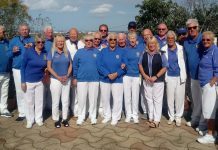 San Luis Bowls Club Report 24.11.17. by Sheila Cammack. 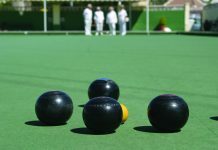 Another lovely week to be out and about on the bowling green; a few unwelcome results but we’re still in there fighting. 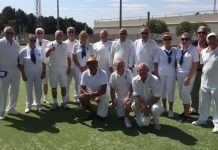 Monday 20th: South Alicante Bowls: SL Klingons home v VB Albatrosses; a great result 12-2, shots 121-93. 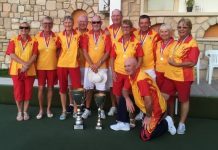 Winners: Janet McEneany, Ann Holland, Peter McEneany 24-16 Colin Jackson, Keith Phillips, Mal Hughes 21-13, Pam Lockett, June & Keith Jones 22-16, Kath Reid, Neil Morrison, Ian Kenyon 30-5, Margaret Morrison, Sabrina & Russell Marks 21-9. 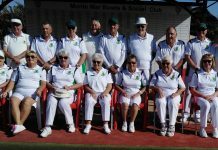 SL Trekkers; a close result away v SM Comets 8-6, shots 97-95. 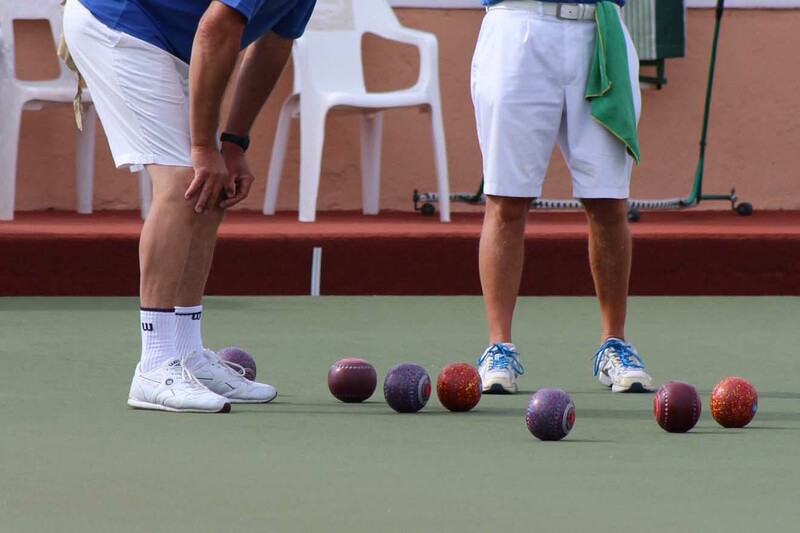 Winners: Alan Bowen, Peter Fuller, Suzi Cooper 24-7, Shirley Verity, Jo & Jules Pering 19-12, . Ros Holmes, Bill Webb, Mike Regan 19-18. SL Vulcans, a good result home v VB Eagles, 10-4, 115 shots-99. 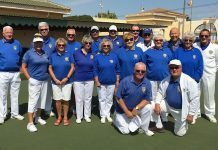 Winners: Walter Lang, Sue Ross, Drew Russell 19-18, Kath Waywell, Jim Wright, Bob Bromley 19-14, Doug & Fay Beattie, Geoff Shand 22-13, Robin Harker, Dave Tilley, Caz Blay 29-11. SL Romulans, away v Q Rubies, a bad day at the office 0 points-14, shots 63-138. 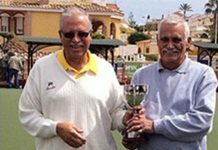 Wednesday 22nd Winter League home v Vistabella; a close fought match, 89 shots-86, 8points-4. Winners: Ann Holland, Keith Phillips, Sabrina Marks, Mal Hughes 26-14, Shirley Verity, Ray Clarke, Jules Pering, Russell Marks 17-16, Kath Reid, Neil Morrison, Scott Malden, Ian Kenyon 25-8. 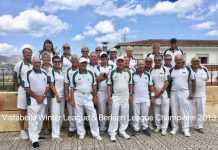 Also great result for the Berleen team; Sheila Cammack, Vic Slater, Peter McEneany, Giuseppe Galelli, winning 24-8. 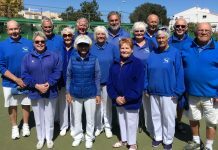 Friday 10th Southern League: SL Lions, away v LM Ospreys, a very close fought match (4 games decided on the last end: 2 in our favour & 2 against!) a frustrating result, 4-10, shots 84-115. Winners: Steve Simmons, Neil Morrison, Ian Kenyon 15-14, Pam Lockett, June & Keith Jones 15-12. SL Tigers, home v Q Swifts, a good result 10-4, shots 104-88. Winners: Allen Bowen, Peter Fuller, Suzi Cooper 24-12, Helen Hammond, Barry Roseveare, Mike Regan 16-14, Marina Beardsall, Jan & Brian Pocock 20-7, Margaret Roseveare, Barry Edwards, Mike Smith 17-14. 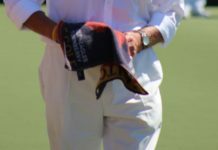 SL Leopards home v CB Geckos; a close match, unfortunately just missing out on 2 other rinks and the shots 102-104, points 4-10. Winners: Ian Ross, Chris Brooks, Dave Steadman 25-9, Doug & Fay Beattie, Geoff Shand 18-14. SL Pumas away v GL Cedars; a tough game 2-12, 87shots-105. Winners: Chris Phillips, Geoff Francis, Albert Jackson 27-9. 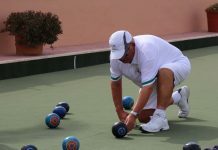 Club information: www.sanluisbowls.byethost7.com or contact June Jones, Club Captain: 691 903 773.